In conjunction with the July 2015 Florence Morning News Bottle Talk article, I wanted to include some other wines I have been drinking lately. One is locally available and the other two were “comped” to me for tasting and analysis. This is not a rare occurrence but I never feel obliged to write about poorly made wine. So please know that the wine I write about, I feel is technically good; whether it’s my type of wine or not. Granted, these are not obscure wines but they are great summer wines nonetheless. I hope you enjoy. This sparkling wine from the Conegliano-Valdobbiadene area is atypical in that it is technically not Prosecco. Prosecco is, technically, 85% Glera grape whereas this wine is a blend of Pinot Nero (Italian name for Pinot Noir) and Merlot. This company, Bisol, has 177 ha of vineyards spread over 35 farms. And although they produce many different sparkling wines, I find this one very interesting. Palate is dry, medium (+) acid, medium body with a foamy slightly aggressive mousse, medium intensity, medium (-) alcohol, with flavors of tart strawberry and vibrant cherry. The cherry flavor pleasantly lingers and has a slightly herbaceous finish. In the heart of the Auxerrois region nestled along the Yonne River is Saint-Bris-le-Vineux. This approximately 100 ha area of Portlandian and Kimmeridgian marly limestone soil is an enigma due to having the only AOC in all of Burgundy dedicated to the Sauvignon (Blanc and Gris) grape. 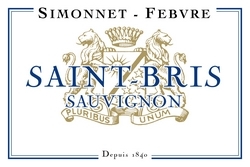 Saint-Bris gained AOC status in 2003 (and was given retroactive status to the 2001 vintage). There are vineyards planted with Chardonnay or Pinot noir but they are not allowed in the Saint-Bris A OC but instead can be included in the appellation Côtes d’Auxerre. Simonnet – Febvre Winery was founded in 1840 and is located around the village Saint-Bris-le-Vineux, southeast of the city of Auxerre, and a few kilometers southwest of Chablis AOC. This particular wine is 100% Sauvignon Blanc and undergoes malolactic fermentation… how would one judge this is your tasting? As an aside this is the only winery in Chablis today to produce a Cremant de Bourgogne. Medium intensity, youthful, aromas of citrus (tangerine), fresh cut grass, crushed leaves. 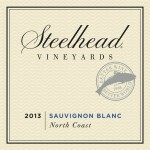 The grapes used by Steelhead Vineyards are sourced from different areas of California depending on the product. In this case, the Sauvignon Blanc grapes are sourced from North Coast American Viticultural Area (AVA). The North Coast AVA covers more than three million acres, including Napa, Sonoma, Mendocino and Lake Counties, and portions of Marin and Solano counties. The AVA contains about 800 wineries, nearly half of the total wineries in the state. The 2013 vintage saw 80% of the grapes come from Lake County AVA and the remainder from Dry Creek Valley AVA. The winery is very involved in donating proceeds to the Steelhead trout and Coho Salmon restoration efforts in Northern California. Also, check the link to the entire Florence Morning News article. Below is a cocktail I made up for the Fourth of July festivities. I hope you enjoy.